Like most people, especially investors, I’ve been wondering about whether there is a philosophical prism through which Donald Trump sees the world other than through deals and negotiations. 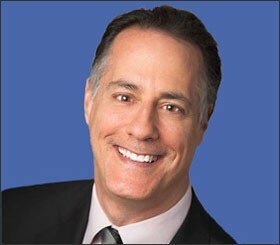 In business, especially in real estate, there are often objective outcomes to shoot for to know if you are winning, especially if you are aggressive. These include getting the largest loan at the lowest cost with the least amount of recourse and operating constraints. And if recourse is involved then using that to your advantage to get much better terms and to have an ace in the hole if things go south and you want to drive a hard bargain in a workout situation. In terms of equity, it’s getting the most ownership and/or upside participation for the least amount of equity contributed and threshold returns to achieve. And when problems do inevitably arise it means cutting a hard bargain with the lender by threatening bankruptcy or walking away and letting them clean up the mess. These types of outcomes are not for the meek or faint of heart. It requires confidence, bravado, brinksmanship, and loving to negotiate. Donald Trump clearly has sharp elbows and is not afraid to use them when he deems it is to his advantage to do so. When it comes to social, economic, and global policy formulation, however, things are not always so black and white, particularly in a world that is so interconnected in terms of supply chains, trade and capital flows, and the movement of people whether it be for tourism or for doing business. And there are also military responses to take into consideration as well. This is where being able to identify some core beliefs and a philosophical prism can come in handy to help make some educated guesses about how things may unfold under a Trump presidency. What are the risks and potential rewards? This post won’t delve into those but will solely focus on the philosophical prism through which Trump may see the world. Dalio is a deep thinker so when he writes or says something I am all eyes and ears. Clearly, he thinks the election of Donald Trump is a sea change with the potential for having profound effects economically that every investor should take into consideration. With this in mind, I knew I had to brush up on my Ayn Rand and her philosophy of objectivism. Admittedly I only got through about 60% of Atlas Shrugged many years ago and at that time I found myself drawn to her philosophy. On the surface, it’s not hard to feel deep respect for the self-made man whose ingenuity and risk-taking are what leads to monumental change and improvement in the quality of our lives. And, conversely, to feel disdain towards those who want to leech off of these powerful men and force them to redistribute their wealth to create more fairness in society. If only life were that simple. As time passed and I experienced more of the world, especially in the realm of investing and going through a number of severe financial and economic dislocations like Long-Term Capital blowing up, the Asian Crisis of 1998 and 1999, the S&L debacle, the Tech Wreck, culminating in the NASDAQ dropping by 80%, and the sub-prime disaster, along with reading more of Charlie Munger’s wisdom and George Soros’ philosophy, two obviously very successful investors, and deep thinkers, I came to realize that her philosophy is naive, a complete fantasy, and at its extreme quite dangerous. And to top it off the real world has proven this to be the case. Whenever free market fundamentalism is allowed to have complete dominance over regulatory checks and balances and prudent tax policy, financial crises often ensue. What really enabled Hitler to rise was the Great Depression. You put on top of the Weimar inflation the Great Depression, and people were just so demoralized that they were subject to being snookered by a guttersnipe like Adolf Hitler. So I think this stuff is deadly serious in that these crazy fools should never let people like Alan Greenspan – he’s an amiable man, but he’s an idiot – should not make the head of the Federal Reserve and governor of all banking; somebody whose hero is Ayn Rand, who believed in no government at all. Those are some pretty strong words from Munger. As I mentioned above, this quotation was in the context of his lamenting that when financial markets are allowed to become casinos due to a lack of regulation and the belief that markets are always efficient and human beings are rational economic actors acting in their self-interest and that this is good for society, terrible consequences can take place. History has proven him to be right in that virtually all of the financial crises that have transpired since 1900 have come from deregulation and a much more permissive and laissez-faire attitude within Congress and President. More on this later. I decided to do a little research on Ayn Rand to see if there were interviews I could find to brush up more on her philosophy. She was very averse to doing interviews so there are not that many out there. While there is one from 1959 with Mike Wallace that goes into a fair amount of detail, I thought I would do a little more research via www.newspaperarchive.com to see if there was something I could find that really got to the heart of her philosophy. 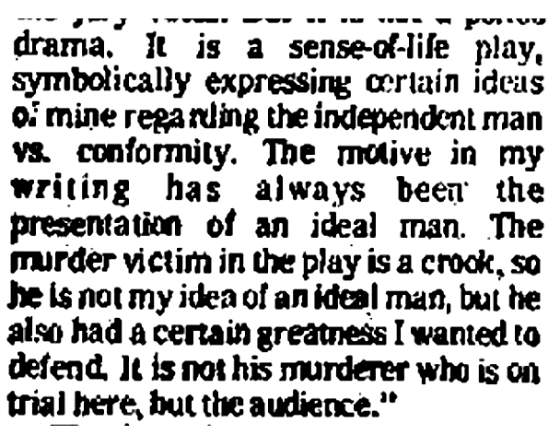 I found an interview she had done with Rex Reed in 1973 that was carried out to discuss the opening of a play she had written that was first performed in 1935 but she was so upset by how it was done that she was determined to do it her own way. In the interview Reed can’t help but ask her about her philosophy and the few things she does discuss regarding her philosophy is quite revealing and, admittedly, a bit disturbing from my perspective. And while there are many people who do not like the politics and social policies of George Soros, there is no denying he is one of the great investors of our time and he credits his success to his philosophy of Reflexivity which is diametrically opposed to Rand’s Objectivism. I will discuss some of the key differences shortly. 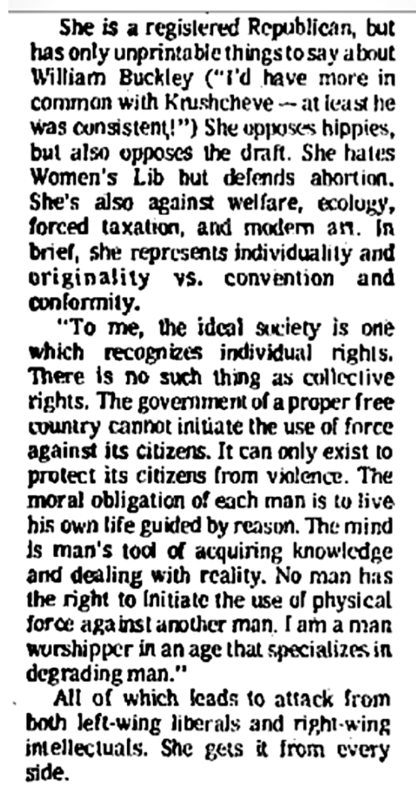 On the surface, I’m ok with her describing the ideal society as she does above. I do take issue with her, however, when she says that “The moral obligation of each man is to live his own life guided by reason.” That is where it gets very dicey for me because we are not rational, thinking, reasoning human beings through and through. We are emotional, scared, flawed, and subject to terrible blind spots that can result in sub-optimal decisions. As my father-in-law likes to say, “there is the Is World and there is the Should World.” She is clearly focused on the “Should World” as the following excerpt conveys. So there you have it. We are emotional, passionate creatures that often focus on our self-interest and don’t have the discipline to create restraints to subordinate our desires and needs to the greater good of our higher selves or society. Much the same can be said about investors who are often driven by fear and greed to buy and sell at the worst times. When reading The Federalist Papers it makes me scornfully laugh at those who subscribe to the economic theory that investors are rational economic beings. This can be the case at times, but overall there are too many contrary examples for me to take rational economics seriously. Soros goes into his philosophy in more depth but this captures the essence of it and is the antithesis of Ayn Rand’s Objectivism. And when Soros’ experience and philosophy are combined with that of Munger and the philosophical underpinnings of the Founding Fathers along with the fact that during the three times there has been a unified Republican government since 1900 a banking crisis has unfolded, does not make me very sympathetic to Ayn Rand adherents. For you history buffs, these were the Panic of 1907, the Great Depression, and the 2007-8 financial meltdown (Technically the Republicans lost control in 2008 but the meltdown was already well under way by then). The DotCom Collapse took place with a Democratic president and Republican-controlled Congress. To be fair, however, the collapse of the S&Ls took place with a Republican president and Democratic Congress, although the economic costs were not as high as the other three but it was still very harmful. Mr. Dalio also believes humans work like machines, a word that appears 84 times in the Principles. The problem, he has often said, is that people are prevented from achieving their best performance by emotional interference. It is something he thinks can be overcome through systematic practice. That applies to managing, too. Successful managers “design a ‘machine’ consisting of the right people doing the right things to get what they want,” he wrote in the Principles. 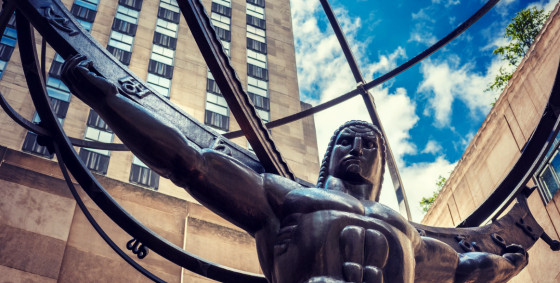 Regardless of what I believe, I would take Ray Dalio’s advice and learn more about Ayn Rand to help decide whether Donald Trump is guided by her philosophy of Objectivism to a meaningful degree. His seeming Bromance with Vladimir Putin would suggest he likes very strong leaders who don’t care about what others think and surround themselves with others who are strong and successful as well but they are clearly in charge. When it comes to the Chinese leadership, however, he seems to have disdain for them as political operatives who made their way to the top of a statist, bureaucratic system. They are not real businessmen or strong leaders with firm control and surrounded by other strong people. Unfortunately, he seems to want to be best friends with a country that is much smaller and weaker economically and be confrontational with one that is much larger and a growing economic and military power with whom we have deep economic ties. Whose advice would you take? We are most certainly living in interesting times. I’ve been following your blog for a while but haven’t commented before. Like your other posts I really enjoyed this one and appreciated you breaking down possible context’s from which the President elect may view the world and the different characters you chose. I’ve read books by all of them and similar to yourself hold their views in high regard. I think it’s too early to tell how things will go and your post helped me understand what some Americans are so afraid of and the potential consequences. Thank you for sharing your thoughts and your kind words. I’m glad you got out of it what you did as that was exactly my intention. No one really knows how Trump will operate or perform but since Ray Dalio is such a brilliant person and investor I thought I would leverage off some of his thoughts and the possible implications. The one thing that is constant is change. We are experiencing a period of seismic change which is unfolding before our eyes. We need to start keeping score at those youth soccer matches and begin to acknowledge accomplishment, not just participation. One should never confuse activity with productivity and I believe that we are embarking on a path that will reward the productive. Lets hope that a different perspective will result in alternative outcomes, unlike that last 20 years in government. A fresh set of eyes might be just the tonic needed to inject some common sense back into our leaders. Well said and so true. I am definitely in the camp that common sense, which Trump clearly has along with those he has nominated for his cabinet, wins out in the end. This will be a fascinating four years and quite a grand experiment. I am cautiously optimistic but feel it is my job to point out some of the risks that may be out there. Doing so helps forces me to try to view things in a more balanced perspective and to take as much emotion out of the equation as I can.